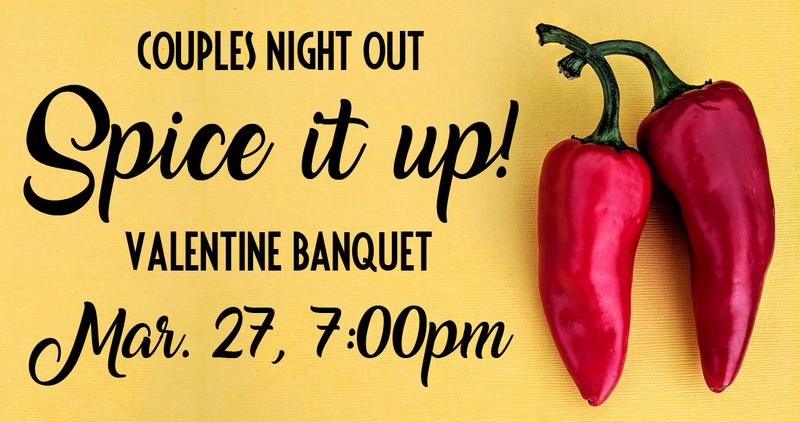 Couples Night Out: Spice it up! New Date: March 27 at 7:00pm--Doors open at 6:30. Cost: $20 per couple before March 17, $30 per couple after March 18. Couples Night Out: Spice it Up! This a great chance for you to celebrate a date night with the one you love. Enjoy appetizers, dinner, dessert, photos, live music, fun entertainment, and a live cooking demonstration and personal testimony of encouragment from Danielle Kartes, author of Rustic Joyful Food. Danielle is guest on “New Day Northwest”, the Hallmark Channel, “The Rachel Ray Show” and more. There is a free childcare event, “Kid-lympics!” for kids of all ages, as well (please include the number of kids you will bring when you register.